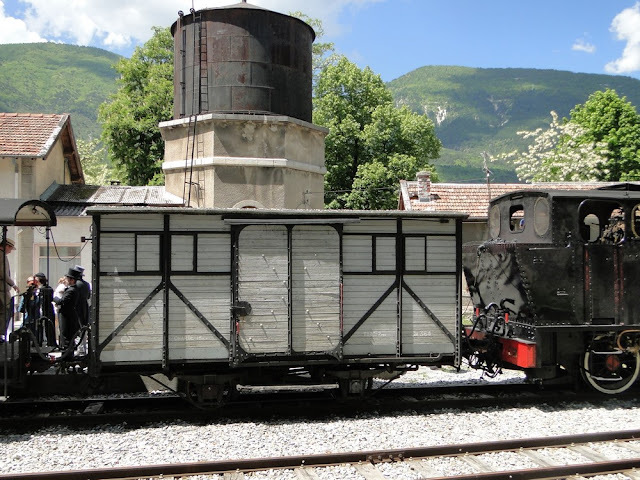 This wagon was built in 1912 by Chantiers de la Buire in Lyon, as one of a set of total 70 units. It carried at Chemins de fer de Provence (CP) the identity J-2364. The wheels are arranged so as to fit the rail layout of the 19th and early 20th century tramways of Tramways de Nice et du Littoral (TNL), in order that goods could be moved without reloading to/from the harbour of Nice on TNL rails (1 meter gauge) and then with CP (1 meter gauge). It is at GECP used as a service vehicle, to form part of the Train des Pignes heritage steam train. Its length is 6.5 m (21.33 ft), height 3.15 m (10.33 ft), weight 7.2 t. I loads 15 t.